If you're a mouse you already know about all those studies that hint at the incredible benefits of green tea. So you're probably downing Matcha Green Tea by the thimble-full, and not just for its exotic spices and almond lusciousness either. But humans are slow. Run up the pants leg of the next person you see and tell them the news. 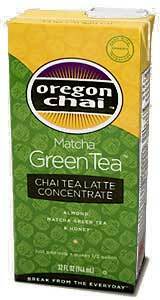 A Matcha Green Tea Chai Tea Latte has approximately 20-25 mg of caffeine per serving (same as a cup of lightly brewed black tea. Coffee has 100-150 mg). To drink hot, heat mixture using stove top or microwave. To drink cold, pour the mixture over ice. Mix equal parts (1 to 1 ratio) of concentrate and milk or soy. Microwave, heat on the stove, or serve over ice.